Dean was born and raised on a grain and livestock family farm located east of Maquoketa. 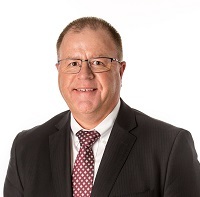 After graduating from Iowa State University with a degree in Agricultural Education in 1985, Dean worked for three years as a Farm Consultant for the Iowa Farm Business Association providing clients in Jackson & Clinton County with farm recordkeeping and farm income tax preparation services. Dean joined the Ohnward organization in 1989 and is a graduate of Cannon Trust School. Equipped to educate clients in the subjects of estate planning, asset and wealth management, individual retirement plans as well as farm and business succession planning, Dean’s passion for financial planning comes from his desire to support people in their efforts to lead the kind of life they want to lead. Dean enjoys serving his community and is active in numerous civic and charitable organizations. Married to Jenny in 1987, they are parents of twin daughters Megan & Beth, who are both pharmacists. As a family, they enjoy going camping together.